Wing span: 1 1/2 - 2 1/2 inches (3.8 - 6.3 cm). Identification: Upperside of male forewing has black checkered pattern on outer half. Female is more heavily patterned, but markings are more brown and diffuse. 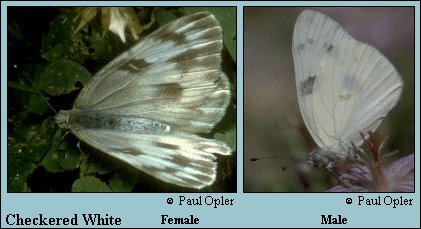 Hindwing of both male and female white. Underside of male hindwing with pale checkered pattern. Underside of female with yellow-tan markings on hindwing and tip of forewing. Short-day form has underside hindwing veins with heavy gray-green outlines. Life history: Males patrol flats seeking receptive females, who lay eggs singly on leaves and flowers of host plants. Buds, flowers, and fruits are favorite foods of caterpillars, but they will also eat leaves. A short-day form appears in spring and fall. Chrysalids hibernate. Flight: Three flights, with a partial 4th in the South, from March-November. Caterpillar hosts: Plants in the mustard family (Brassicaceae) including cabbage (Brassica oleraceae); and caper family (Capparidaceae) including Rocky Mountain bee-plant (Cleome serrulata). Adult food: Flower nectar including hedge mustards, composites, and alfalfa. Habitat: Wide variety of sites including dry weedy areas, vacant lots, fields, pastures, sandy areas, railroad beds, and roads. Range: Permanent resident in southern United States and northern Mexico; temporary in northern United States and southern Canada. Does not occur in most of New England.